WMAP First-year Paper Figures, Hinshaw, et al. 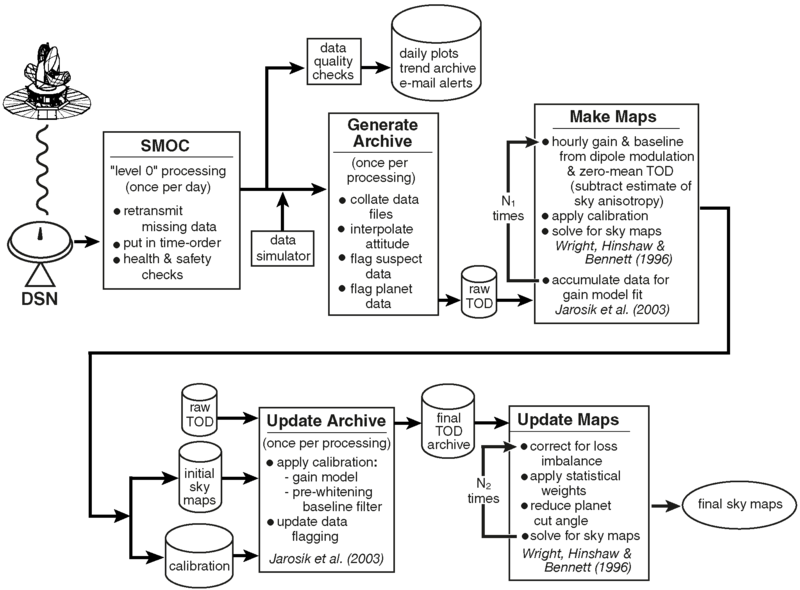 Schematic overview of the WMAP sky map processing pipeline. Residual sky map, tout-tin, from an "ideal" first-year simulation of Q2 data, designed to test the iterative map-making algorithm presented in ξ2.2. 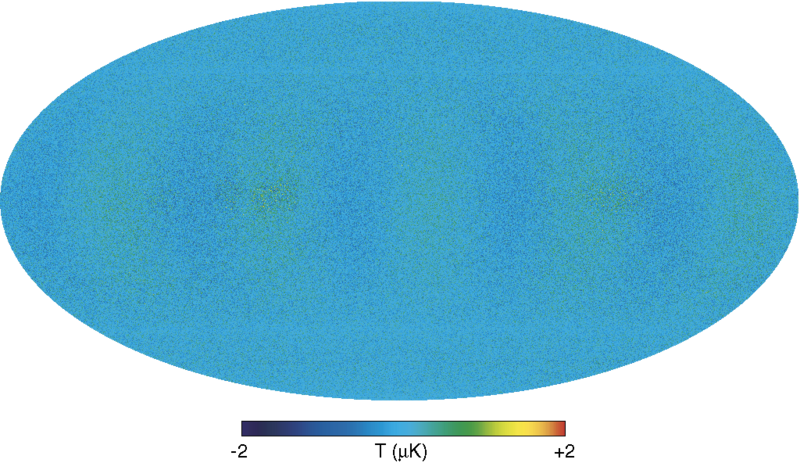 The input sky map included realistic CMB signal with a peak-to-peak amplitude of roughly ±420 μK and a Galactic signal with a peak brightness of ~50 mK. The rms structure in this map is less than 0.2 μK, after accounting for the 0.15 μK noise that was introduced to the simulation to dither the digitized signal. The map is projected in ecliptic coordinates and shows the anisotropy mode that is least well measured by WMAP, as a result of a combination of the scan pattern and the beam separation angle. This residual level is the result of 50 iterations of the algorithm; more iterations would reduce it even further. Convergence of the dipole-based gain solution for a selected WMAP radiometer channel (K113) based on a 1 yr simulation. This simulation was generated with an input gain of 300.0 du mK-1 and minimal noise. 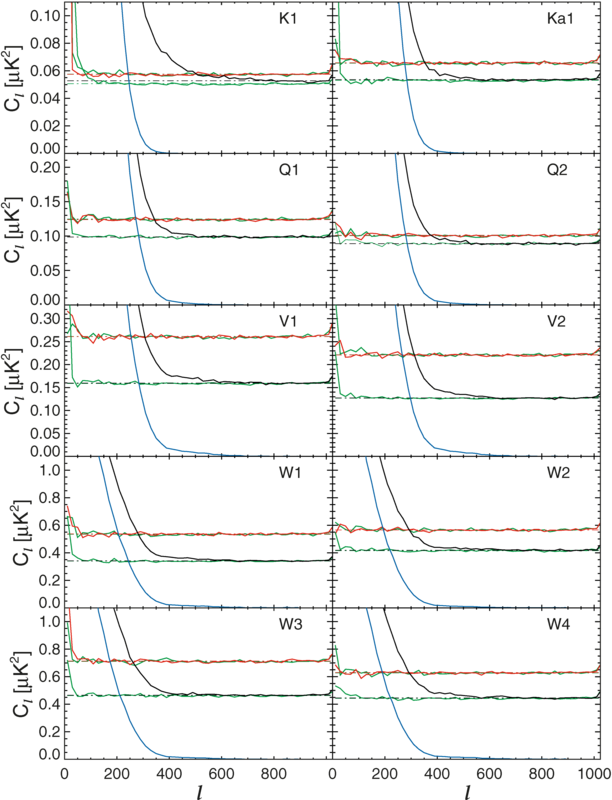 The first iteration, which assumes that the sky model has only a dipole component, leaves residual gain errors of up to 7%, as a result of the projection of the relatively bright Galactic emission onto the dipole model. After 30 iterations of the simultaneous fit described in ξ 2.3.1, the residual errors in the gain solution are less than 0.1%. Hourly gain and baseline fit described in ξ 2.3.1 from the flight data for channels K113 and V113. The top two panels show the gain solution, the bottom two the baseline. Note that the gain is stable to ~5% over the first year (see also Table 3). The variable noise is due to the changing projection of the scan pattern on the CMB dipole over the course of a year. 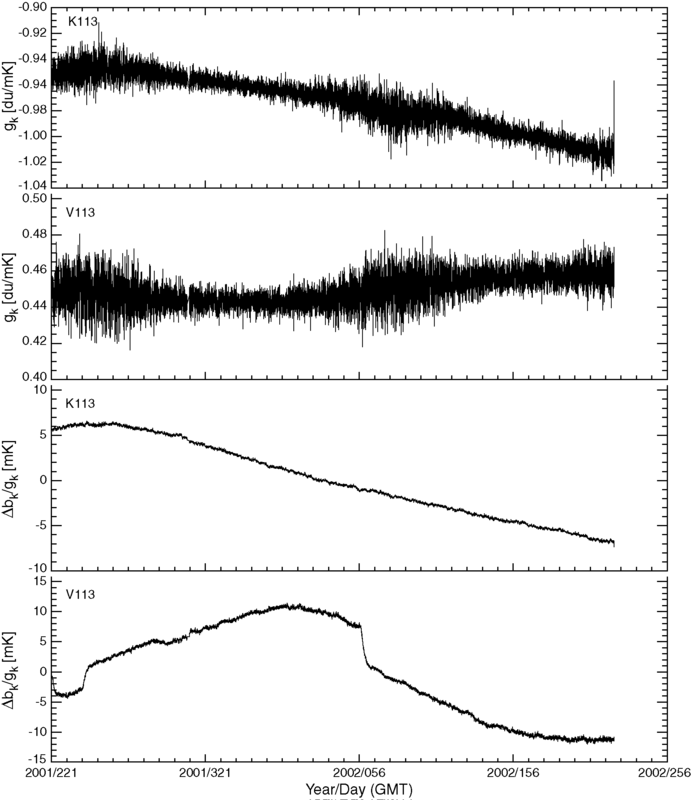 The instrument baselines have a typical drift of 5–10 mK over the year. 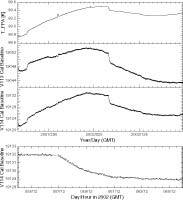 The channel V113 exhibits one of the clearest thermal susceptibilities of the WMAP radiometers, although we show in ξ 3.4.1 that the induced systematic signal is negligible. See also Fig. 15. 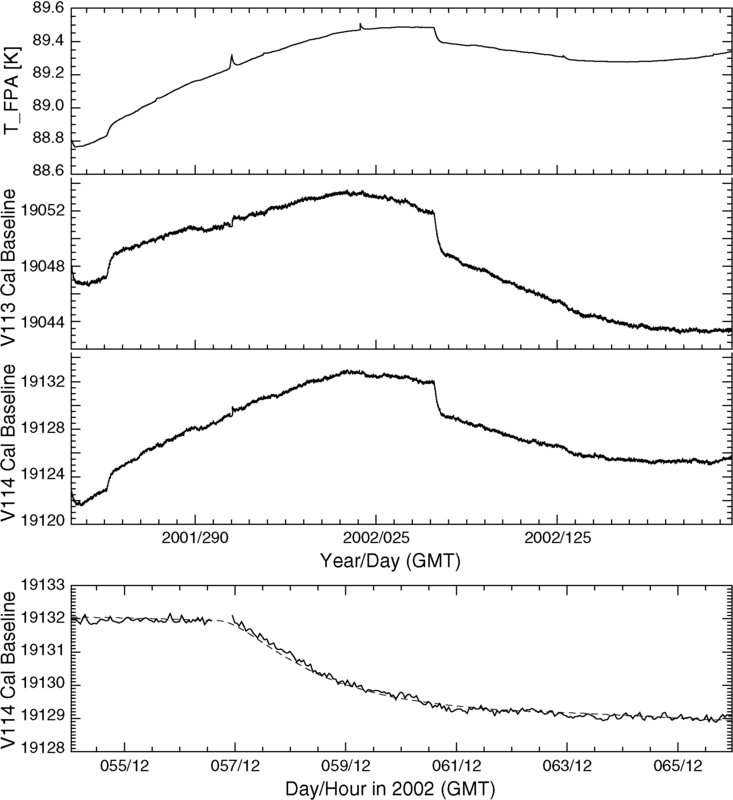 Left: Measured autocorrelation function, C(Δt)/C(0), for selected radiometers, of WMAP time-ordered data, after subtracting a model sky signal based on the initial sky maps. The model fits are indicated by a cross at a lag of one observation and by straight lines for Δt > τ (see ξ 2.4.2). All of the WMAP DAs except W4 have a covariance of less than 1% at nonzero lag (Table 4). The anticorrelation at lag ~2000 s is due to the subtraction of the hourly baseline as a prefilter. Middle: Prewhitening filter, in the frequency domain, that is applied to the time-ordered data after a model sky signal has been subtracted. The vertical dashed line indicates the spin frequency, 7.7 mHz, and the number indicates the fraction of power transmitted by the filter at the spin frequency. 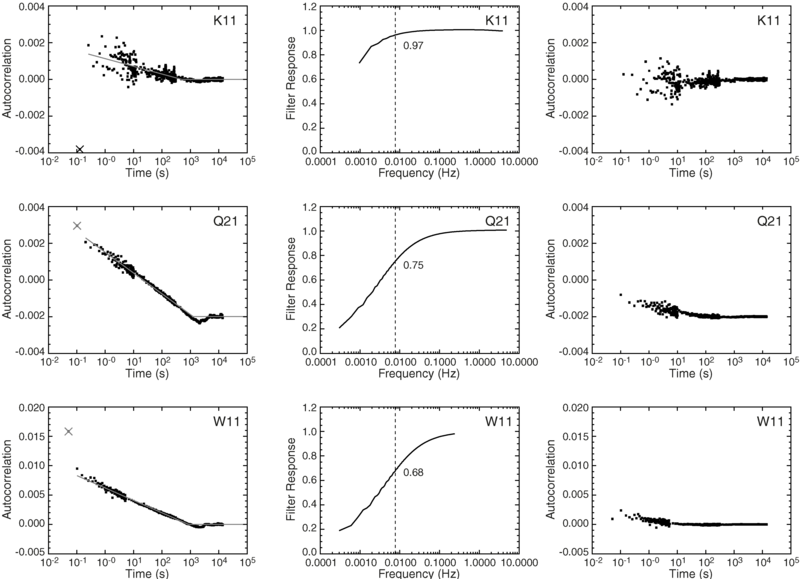 Right: Measured autocorrelation function for selected channels of WMAP time-ordered data, after prewhitening, on the same scale as the left-hand panels. The apparent change in noise level at different lags in C(Δt) is due to a stepwise change of bin size in Δt. Time-ordered data for channel W424 before (black) and after (red ) applying the prewhitening filter. The data are boxcar averaged over a 46.08 s window to show the low-frequency noise in the unfiltered data. 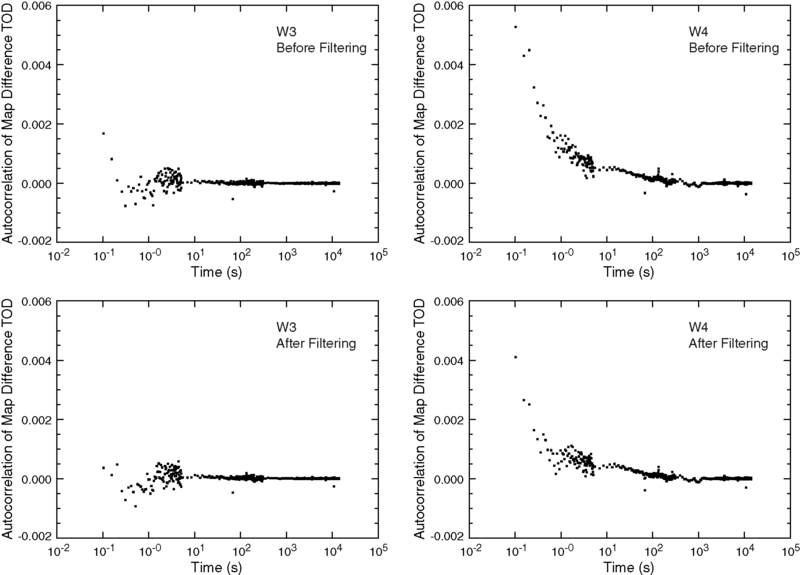 Without averaging, the data before and after filtering are virtually indistinguishable. 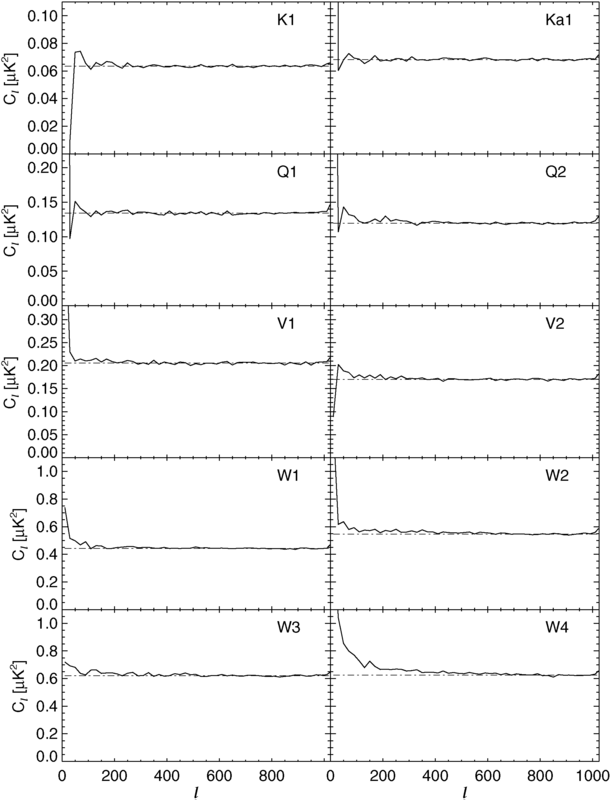 Note that baseline variations in this channel are of order 2 mK on a 1 hr timescale, as expected given the measured 1/ƒ knee frequency of this radiometer (Jarosik et al. 2003b). W4 is the worst DA from the standpoint of 1/ƒ noise. Simulated and flight difference maps showing the structure that is removed from the maps by the prewhitening filter. All four maps are differences between sky maps generated before and after baseline filtering. The maps are projected in Galactic coordinates, and the temperature scale on each is ±50 µK. 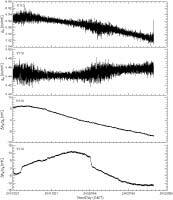 The "blobs" of white noise along the ecliptic plane can be ignored. They arise from differences in the handling of planet flags in the two forms of the mapmaking code. The top two panels show W3 and W4 data from a 1 yr simulation that includes flightlike 1/ƒ noise in the time-ordered data. The bottom two panels are the same for the flight W3 and W4 maps. Note the very different structure between W3 and W4, as a result of different 1/ƒ knee frequencies (Jarosik et al. 2003b). Note also that the simulation captures the basic structure of the flight data very well. Recovered gain solutions for channel V113 in a flightlike simulation (top) and in the flight data (bottom). 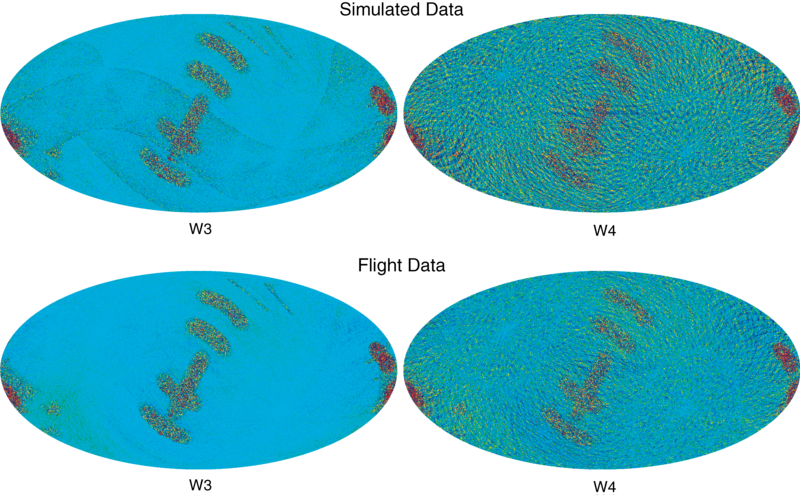 The "noisy" black traces show the hourly baseline binned in 24 hr samples (to reduce noise), and the green traces are the best-fit gain model (§ 2.4.1). For the simulation, the input gain used to generate the simulated data is shown in gray. In the simulation, the absolute gain is recovered to better than 0.1% in all 40 channels, and the binned hourly gain is everywhere within ~0.2% of the gain model and the input gain. Gain changes are well tracked by the pipeline. 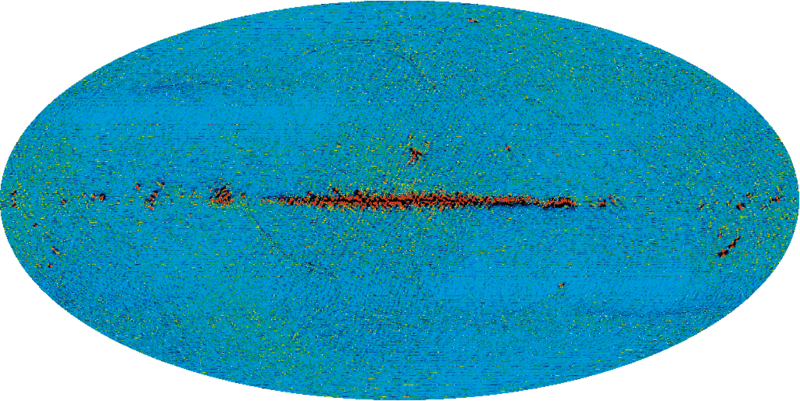 Angular power spectra of the 10 residual maps tout - tin generated from the flightlike 1 yr simulation. 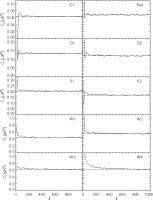 In each case the spectra were evaluated in the Kp2 cut sky (Bennett et al. 2003c). Table 5 quantifies structure in these maps beyond flat white noise. Note that most features are restricted to l≤25, but with an amplitude that is still much less than the sky signal in this range. The residual effects of 1/ƒ noise are seen in the gradual rise of the noise spectrum at low l in W4. See Hinshaw et al. (2003) for further discussion of this. Two-point correlation functions of Δ12 difference maps for three different DAs. With the exception of a ~0.3% blip at the beam separation angle, θbeam ~ 141°, there is relatively little structure in the difference maps (see § 3.2). The two-point functions of these maps provide a good representation of the angle-averaged pixel-pixel noise covariance in the flight maps. Angular power spectra of signal and noise maps for each DA. 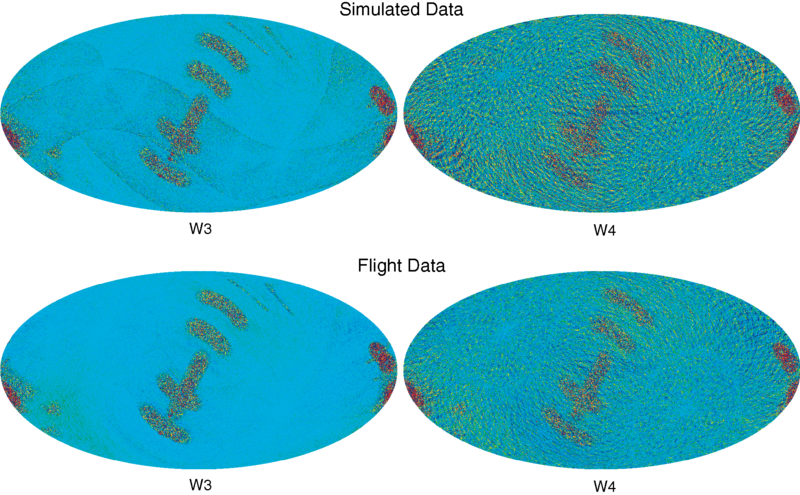 In each panel, the upper red and green traces are the spectra of the null maps Δ34 and Δ1234, respectively. The lower green trace is the Δ12 map, and the black trace is the signal map. 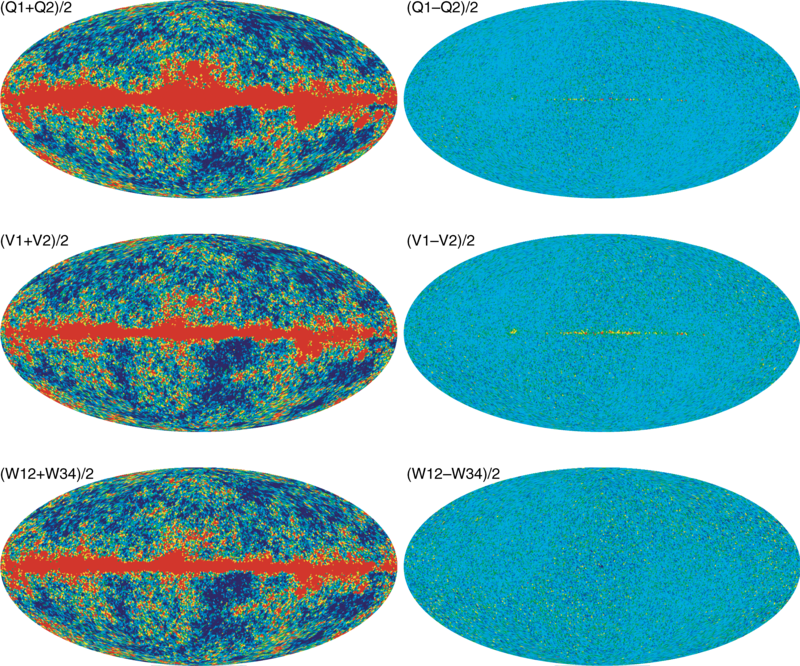 The blue curve is our best estimate of the underlying CMB signal from Hinshaw et al. (2003). 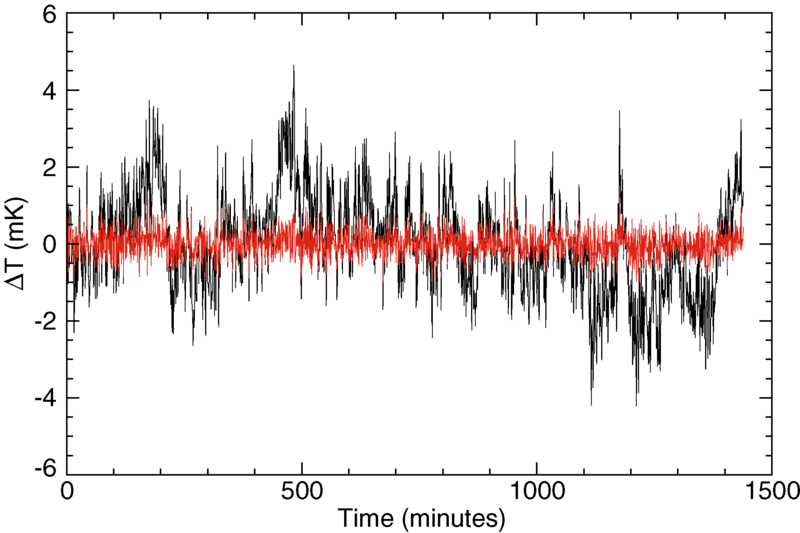 The pairing of white-noise levels is discussed in § 3.2. Table 6 presents a measure of structure in the difference spectra, which are remarkably flat. Estimate of pixel-pixel noise covariance in a W3 and W4 noise map along the scan direction before and after filtering (top and bottom,respectively). See § 3.2 for a description of the processing steps used to produce these data. The stripe covariance is negligible in W3 and less than 0.2% in W4 for lags greater than 0.1 s (pixel separation > 0.25°). All other DAs will have at least 2–3 times lower covariance than W4. Note that the relative reduction in the off-diagonal elements after filtering is due to a decrease in the stripe amplitude, C(Δt), not due to an increase in the white noise, C(0). Residual map from a K-band elliptical beam simulation. 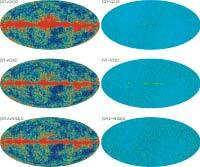 The output map was generated from a 1 yr simulation of data with an elliptical beam response. The residual map shown was generated by subtracting the underlying sky signal convolved with the nearest effective circular beam response. This remaining structure contributes to the four-point fluctuation spectrum. The scale of the color range is ±10 µK. 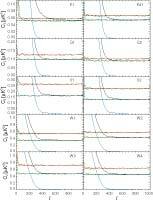 The rms structure in the Kp2 cut sky is 2 µK. See § 3.3.4. Illustration of the mild thermal susceptibility of the instrument baseline. 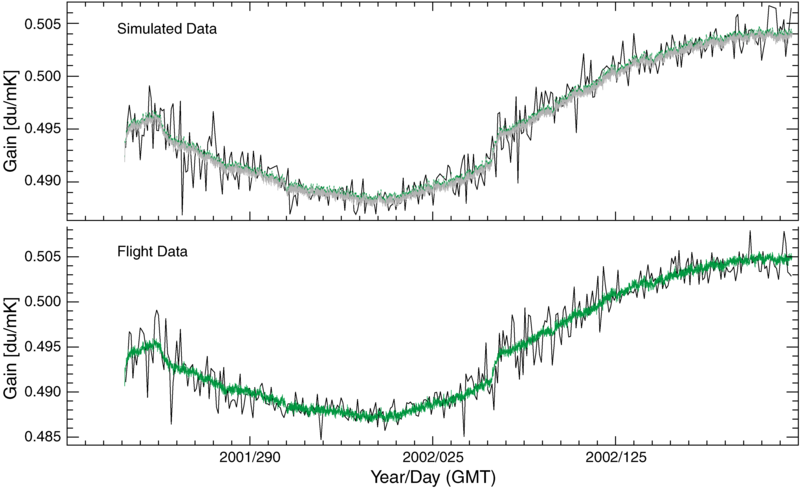 The top panel shows the temperature of the instrument FPA over the course of the first year. The second and third panels show the hourly baseline solution for channels V113 and V114, which are among the most thermally susceptible. Note that the thermal baseline response is mostly common mode. The channel combination that contains sky signal is the difference between channels 3 and 4; thus, most of this response cancels. On day 2002:054 GMT a partial battery cell failure led to a commanded decrease in spacecraft bus voltage with a corresponding decrease in overall power dissipation and spacecraft temperature. This event provides a clean measurement of the instrument baseline thermal susceptibility; the bottom panel shows a close-up of the V114 baseline near this event. The dashed line is a fit to a model including a term proportional to db=dTFPA. The best-fit susceptibility values for all channels are given in Table 8. See Limon et al. (2003) for a complete discussion of WMAP’s first-year thermal profile.